I was fascinated by the Serial podcast and Catherine at Gilmore Guide to Books raved about this follow-up book. I bought the audio during Audible’s holiday sale…I figured I might as well continue this story in audio form. Susie at Novel Visits included this mystery on her Best Books of 2016 list and called it “a dark story about two families in a very small town,” which sounds right up my alley. This sci-fi novel is 100% out of my wheelhouse, but Carrie Lippert (a TV host and travel blogger, who is also a big reader with taste similar to mine) said it was a sci-fi novel that would appeal to people that aren’t normally fans of that genre. I’ve always been fascinated by life behind the Iron Curtain and Eva at Paperback Princess put this true story of a family separated by the Berlin Wall on my radar with her review during Nonfiction November. Catherine at Gilmore Guide recommended this novel about the effects of depression on a family and then I saw it on numerous Best Books of 2016 lists. Joann at Lakeside Musing has been raving about this slim novel for months now. Monika at Lovely Bookshelf‘s review of this novel about college grads living in San Francisco put it on my radar and I’ve since seen it on multiple Best Books of 2016 lists. I’ve been hearing this nonfiction is a logical companion to Hillbilly Elegy, one of my favorite books of 2016. A memoir by someone who sounds like he could quite possibly be the most interesting man in the world. This memoir of a girl who grew up in a polygamist cult has been on my TBR list for a year now. 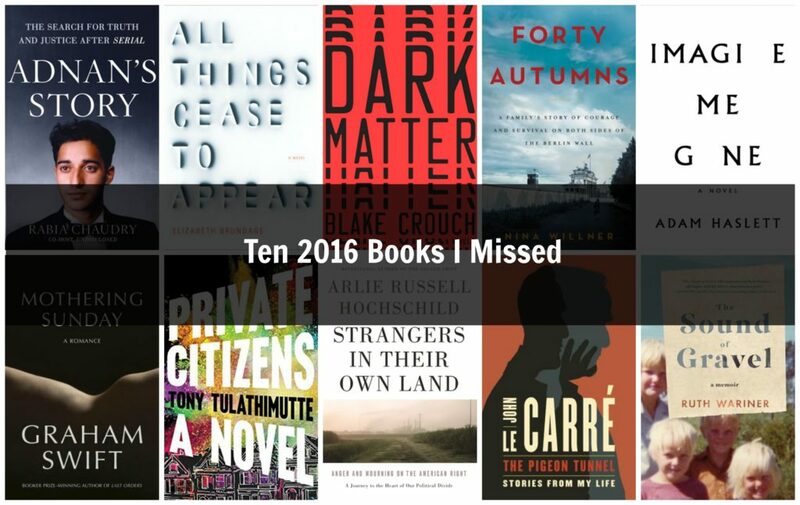 What 2016 books did you miss? Well – I’m #30 something on the library’s waitlist, so I don’t think it’ll be soon, but I’ll get there! Hope you check out Mothering Sunday… so quiet and beautiful. Best read in a sitting to two! I’m on the library hold list! I have a couple of these on my shelves – DARK MATTER and ALL THINGS CEASE TO APPEAR. Hope to get to them this year. Imagine Me Gone went to my DNF list. I just could not get into the story, though now I wish I’d given it a little longer. The Sound of Glass does sound very interesting, and Mothering Sunday I’m very curious about now. Forty Autumns sounds intriguing – I’ll have to add it to my list! Happy reading! I just picked up Strangers in Their Own Land with a Christmas gift certificate…it looks really good, I can’t wait to read it! I missed far too many to count. I did read The Sound of Gravel and liked it a lot even though it’s a sad story. I haven’t heard anything negative about it yet, so am looking forward to it. Plus, I love reading about cultish fringe religions. I’m reading it now – almost halfway through. Really enjoying it…having a little trouble getting through Michael’s sections, as I’m not super into music, but loving the rest of it. I just finished Dark Matter and it was AMAZING. I’m also not a big sci-fi reader, but this one was so much more than that! I hadn’t heard of Strangers in their Own Land but I’ve got Hillbilly Elegy coming up soon so I’ll have to keep it in mind! Thanks for the shout out! I think you will love Forty Autumns. I still think about it often – especially about the author’s grandparents. Dark Matter was really good too. I don’t normally read the genre either but this was a thrill ride that I really enjoyed. I’ve added Imagine Me Gone to my list! And I like the idea of listening to the rest of Adnan’s story via audio…maybe my first audiobook? I downloaded 40 Autumns sample and really loved the beginning..she sucked me right in, so I’m planning to read it soon. And so glad to hear you say that about Dark Matter – gives me hope! I would agree with your friend on Dark Matter. Anyone can read that one – it’s not too “sciency”, but it is high concept. Lots of fun! I’m a huge scifi fan and adored Dark Matter so I always want people to read it. Knowing you are not a fan of the genre, I would love to hear your thoughts. I hope you get around to reading it soon! I missed all of those too! Of these books I do want to read Imagine Me Gone, and I hope I can get to it, one of the downsides of book blogging is spending too much time looking forward. The Sound of Gravel sounds very interesting!! I hope you find time for all these books. Oh – interesting – a Hillbilly/Strangers readalong! Imagine Me Gone is one that I wish I had gotten to. And I would like to try Dark Matter, despite the fact that it is out of my wheelhouse. I’ll be moving my books soon and can only imagine the titles from the past that I will uncover! I’m halfway through Imagine now and liking it. I LOVED “Dark Matter” and I totally agree that it’s accessible to all readers, not just sci-fi fans. It’s part science fiction, part thriller and part love story, and it’s also completely engrossing! I think you should move it toward the top of your list! The only other book I’ve read (so far) from your list is “The Sound of Gravel.” It was certainly an interesting story and worthy of a read, but I was left with a lot of lingering questions. I didn’t realize Rabia had a podcast..I’ll have to look for that one. You know how I feel about Shelter! And I still need to get to the other two as well. Four of these are also on my shelf waiting. Let’s see if we can both get them done! Re Adnan, I loved the podcast but felt I wanted to see things on paper. So I did get the audio, but the kindle book was on sale for $2, so I bought it and thought I might do a readalong with myself. Hoping that helps, this case is so fact intensive. Good to know…I’ll keep that in mind and switch to the book version if I get bogged down. Dark Matter is on my list as well, I’m looking forward to it. Some great choices here I’d not heard of, thanks for sharing! I really liked Private Citizens! I haven’t read any of the others, but Dark Matter has been catching my eye. All Things Cease to Appear *was* a good read! I totally forgot about that one! I missed all of these book as well … Private Citizens and Strangers In Their Own Land are languishing on my bookshelves. Mothering Sunday is hiding out in my kindle cloud. Thanks for this post — good reminder that there are some good reads waiting for me. Dark Matter was a fun enough read but I wasn’t a fan of the writing style to be honest! Yowza, I made the list twice?! That’s a lot of pressure! I hope Imagine Me Gone works. The beginning has a lot of elements that can be confusing at first. I’m so torn on Dark Matter. I’ve heard really conflicting things about it and because it’s already outside of my normal genres, I’m hesitant (I even checked it out from the library and returned it unread). Let me know what you think! It’s so outside the norm for me too, but I’ve got it on hold at the library, so there’s no risk in at least giving it a shot. The NIX! By Nathan Hill. The audible recording by Ari Fliakos is hands down the best audiobook I’ve ever listened to. You should really take a look back at this one.